The Red Kite Challenge is an established, annual series of running and walking events with the profits going to support our local hospital. Whether you’re a seasoned trail runner, a novice jogger or simply enjoy a stroll in the woods, we’ll have an event to suit your needs. We can offer you a senior half marathon, a 10k trail race, a non-competitive walk and junior U20, U17, U15 trail races. There will be prizes for seniors and masters in five year age groups in both the half marathon and 10k and team prizes for the half marathon. There will also be a memento for all finishers in each event. There will be race marshals, feed & water stations, a refreshment tent and first aid provision. The Red Kite Challenge headquaters are located at the Woodlands Caravan Park on the edge of Devil’s Bridge, three miles from Ponterwyd on the A44 which is itself 12 miles inland from Aberystwyth. For SATNAV users the postcode is: SY23 3JW. Start times: Walk 11:00, Junior Races 11:15, Half Marathon & 10k: 13:00. Entry Fees: Half Marathon £15.00, 10k £12.00,Junior Races £6.00, Walk £7.00. 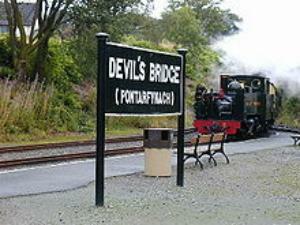 Devil's Bridge is located on the A4120 (Aberystwyth - Ponterwyd) road. It is in close proximity to the A44 (from the east) and the A487 coast road at Aberystwyth. The nearest mainline railway station is at Aberystwyth; however the Vale of Rheidol narrow gauge railway terminates in Devil's Bridge.